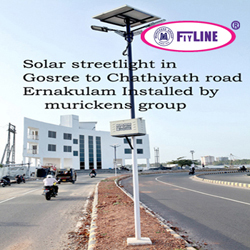 Muricken's "Flyline Solar DC Power System” By using solar energy DC 12/24V we can light the street lights, garden light, houseboats, shops, advertising posters, houses etc. The only limitations are your imagination. The main advantage of the Solar DC Power System is that it is absolutely free from AC and electricity bill. It is also useful in places where there is no power - deserts, and ocean and imagine of places anywhere on earth where sun light is available. Made robust and weather proof to withstand heavy weather. ► DC volt out put 12V or 24 V. ► MNRE approved. ► German Technology assures the quality of flyline solar garden light. ► ISO 9001- 2015 quality certified product . ► Flyline solar luminary cabinet is weather proof so it is an Ideal for Streetlight, garden light, Gate light, and park light. ► It have automatic control system (Dusk to Down). ► It is available in 3w, 6w, 9w, 12w, 18w and above. ► Dimmer option after 6 hours. ► By using powerful LED we get good brightness for the light. ► Its power consumption is very low and get very good back up. ► No need of wiring, so we can forget the headache of wiring and its expense. ► With the cost of AC cable and wiring, you can install a fly line full light system, with out electricity bill. ► We can charge the battery with the help of solar cell. ► Its Initial cost is also very low. ► No further expense. ► Very low maintenance. ► Specially designed compact control system protect the whole unit. Driver technology Micro Controller Based PWM C.C.C.V. © Murickens Group 2000-2019 All Rights Reserved.